To avoid my email address being spammed, I do not publish it on my site. If you want to contact me, leave a reaction here. It will not be published, but I will get your message. Eind van het jaar. Tijd van lijstjes van het afgelopen jaar. U denkt dat dat iets typisch menselijks is. Maar dat is niet zo. Honden doen het ook. Althans sommige honden. Beter gezegd, witte poedels, en dan alleen reutjes. Zo verkiest een commissie van witte poedel reutjes het Baasje van het Jaar. Die commissie benoemt zichzelf. En wel zo dat er geen teefjes in de commissie zitten. Of zwarte poedels. En al helemaal geen andere rassen. Herders, teckels, collies, labradors, spaniels, boxers, dalmatiërs, nee die komen niet in deze belangrijke commissie, laat staan een hond van het vuilnisbakken ras. Nu zult U vragen wat de criteria zijn waarop het Baasje van het Jaar wordt verkozen. Vaak en goed aanhalen? Lekker eten geven? Vaak uit wandelen gaan? Nee, allereerst moet het baasje ook wit zijn en een piemel hebben. Witte poedel reutjes kunnen zich namelijk niet voorstellen dat het Baasje van het Jaar een vrouwtje is of een kleurtje heeft. Verder wordt de uitslag alleen bepaald door welk baasje de meeste ballen gooit. Waarheen maakt niet uit, hoever maakt niet uit, wat voor soort bal maakt niet uit. De meeste ballen, daar gaat het om. Witte poedel reutjes vinden het namelijk erg belangrijk om enthousiast achter een bal aan te rennen en deze dan hevig kwispelend terug brengen bij het Baasje. U begrijpt dit is ieder jaar weer een belangrijk gebeuren is in de hondenwereld. Dagen achter elkaar beheerst het het hondennieuws. Dan wordt dan de winnaar bekend gemaakt. Een winnaar die de rest van het jaar rondloopt als een hond met zeven staarten. Zo groot is de eer. Dat denken de witte poedel reutjes. U weet natuurlijk beter. Het is dat het honden zijn. Met mensen zou dit nooit gebeuren. Kunt U zich voorstellen dat de Politicus van het Jaar zo zou worden verkozen? 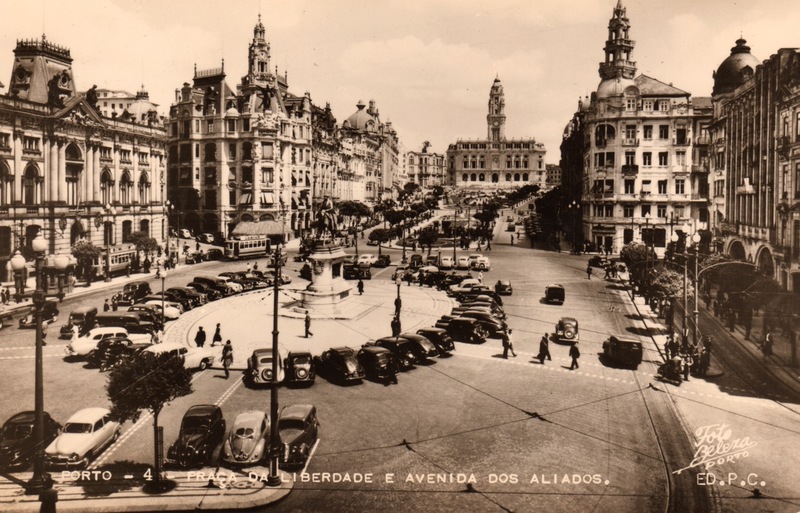 Likely it had just rained when this photo was made of Praça da Liberdade and the Avenida dos Aliados. 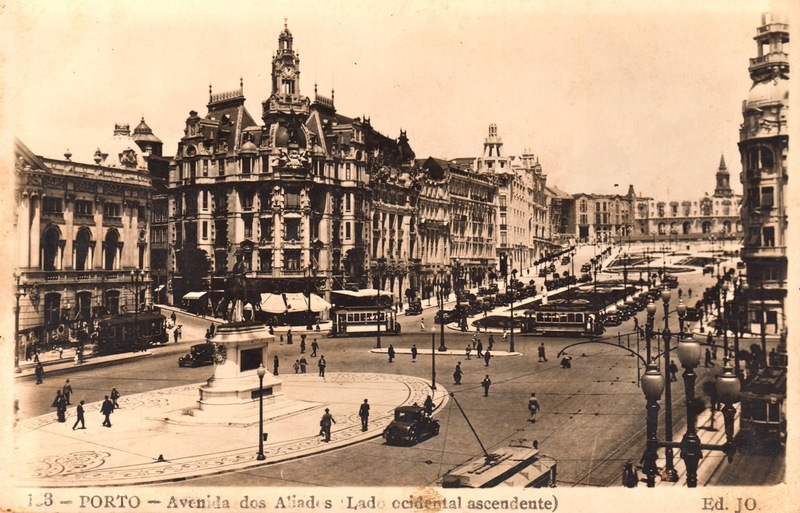 Looking over Praça da Liberdade and Avenida dos Aliados. The trams are now in the STCP colours. 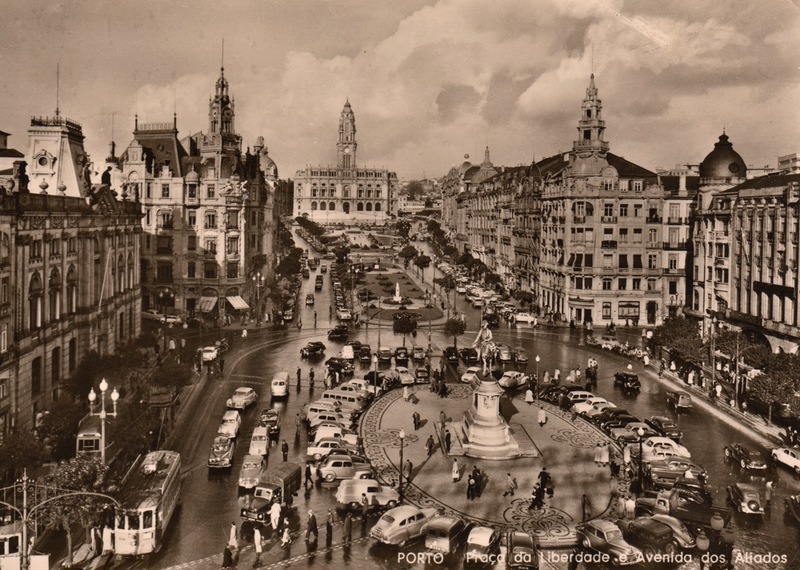 Looking over Praça da Liberdade in northern direction with the Avenida dos Aliados and the town-hall now looking almost finished, although it was only in 1957 after a construction period of 37 years when it was ready for use. The trams are still yellow. A zorra with coal is just coming out of Rua de Sampoio Bruno. 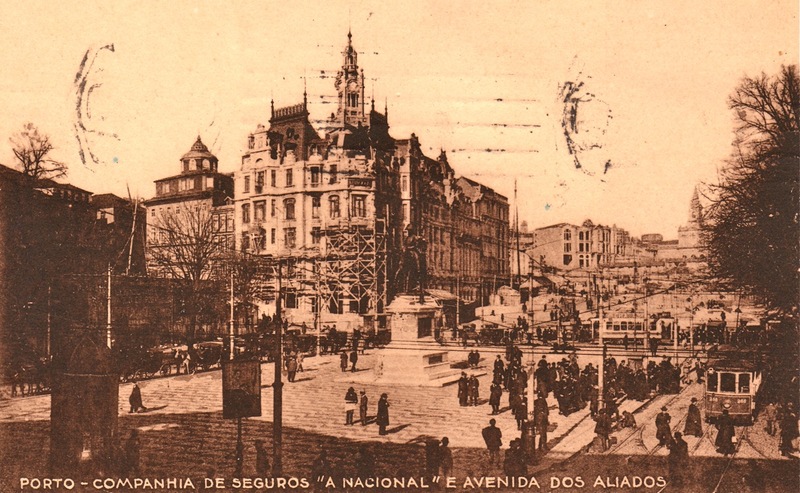 Praça da Liberdade with Avenida dos Aliados and the town-hall under construction. Tram 151 in the foreground is still green. The other three trams are already yellow. The first is one of six build during the period 1901-1903 by the local company A Constructora. The other two were ordered from Brill in 1909. 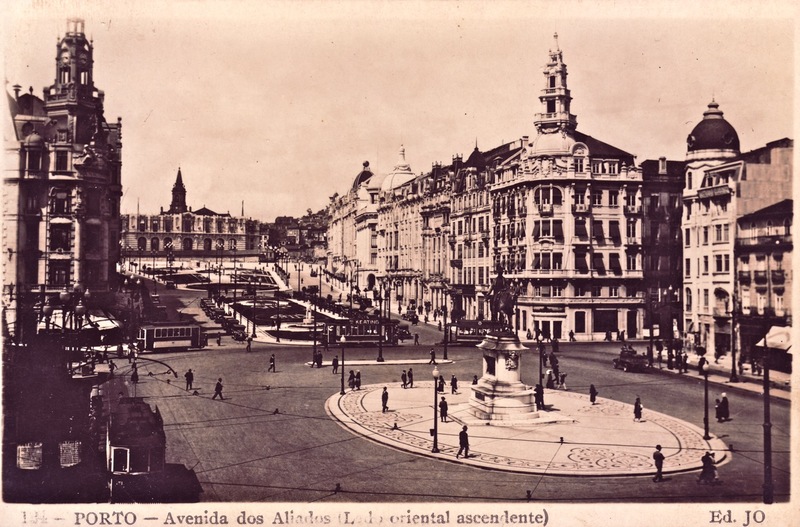 Taken from the south in northern direction we see Praça da Liberdade and Avenida dos Aliados with the town-hall under construction and behind it the tower of Trindade. Tram 108 at the right is build during in the period 1904-1906 by the local company A Constructora. The next two trams were ordered from Brill in 1910 or 1912 and 1909. These three trams are still green. The last tram is already yellow and of the type build in 1929 or 1930 by the local workshops. 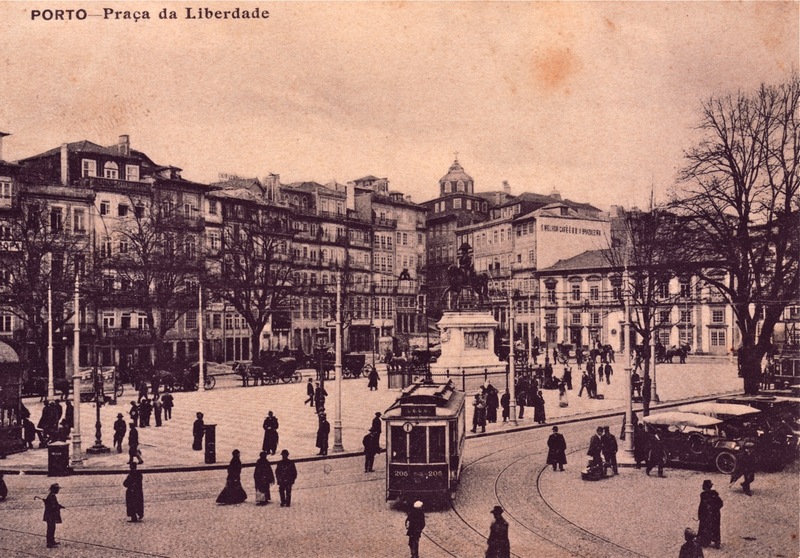 Taken from the east side of Praça da Liberdade we see the north part of it with two trams. The one in front is likely 235, a tram ordered from Brill in 1910 or 1912. The fleet numbers are white, which means the tram is still green. The tram nearest to the camera is 284, build in 1928 by the local workshops. Although its basically of the same design, it’s longer and wider resulting in a larger capacity. The fleet numbers of this tram are black, which means it is already painted yellow. The colour change of the trams happened in 1933 and this indicates the year the photo was taken. 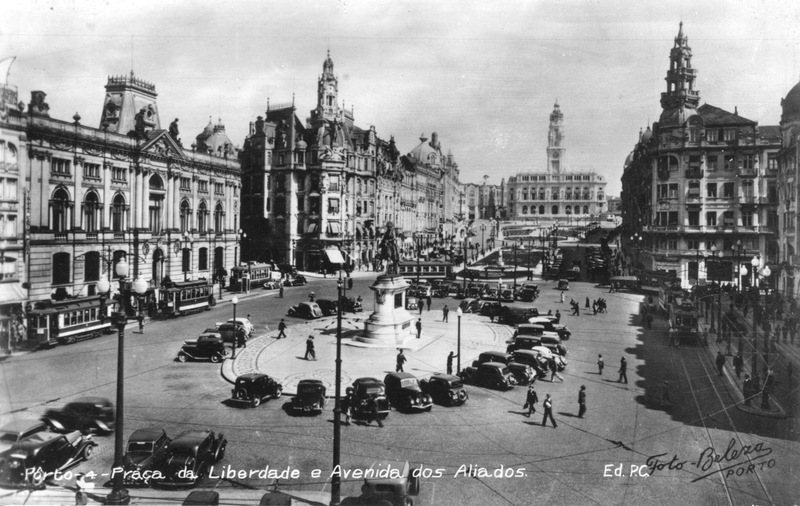 Taken from the south-eastern corner of Praça we see the north part and Avenida dos Aliados. With the old ortho-chromatic photo emulsions the colour yellow shows as dark on photos, which makes it difficult to distinguish it from green. However with the colour change of the trams in 1933 from green to yellow, the fleet numbers were changed from white to black. The tram in the distance is already yellow, but the one in the front is still green. This tram with the number 305 was build in 1929 by the local workshops. 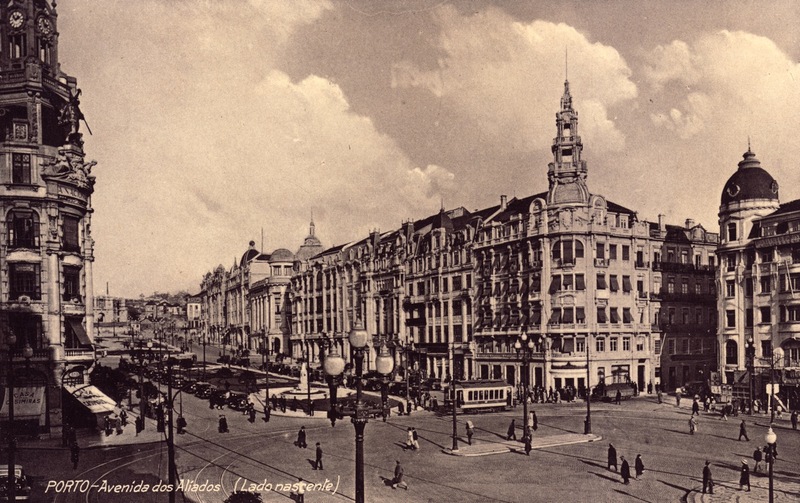 This photo is taken from the western side of Praça da Liberdade in north-eastern direction. 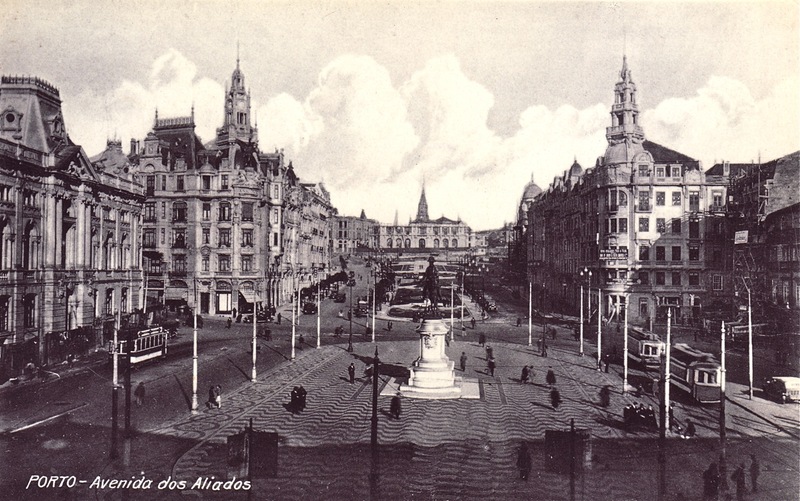 It shows the north part of Praça and Avenida dos Aliados. 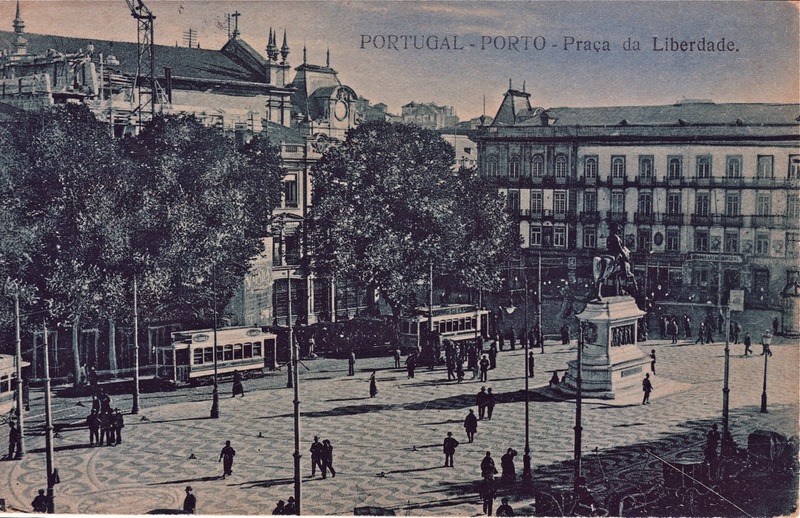 The layout of Praça da Liberdade is already changed, but the tram is still green, which places the photo in the period 1930-1933. The tram is one of the series ordered in 1910 or 1912 from Brill. A freight tram (zorra) is coming out of Rua de Sampoio Bruno. Likely its loaded with coal and on the way from the mine in São Pedro da Cova to the power plant in Massarelos. 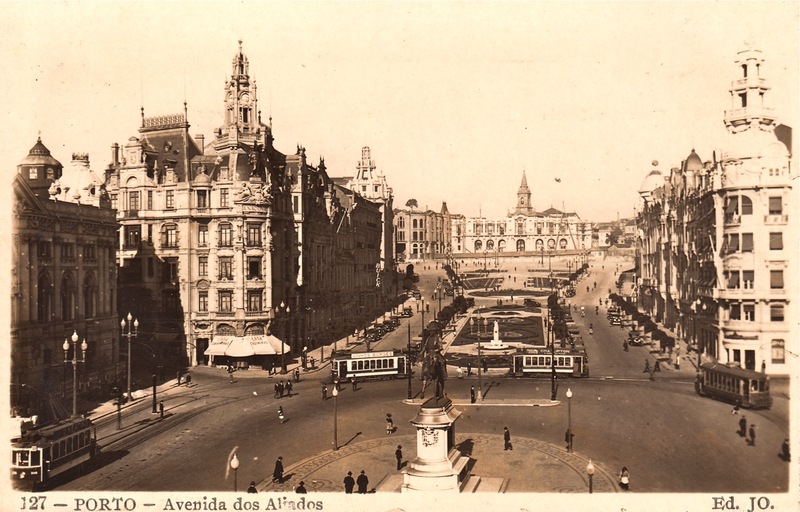 This postcard shows Praça da Liberdade and Avenida dos Aliados with the town-hall under construction. 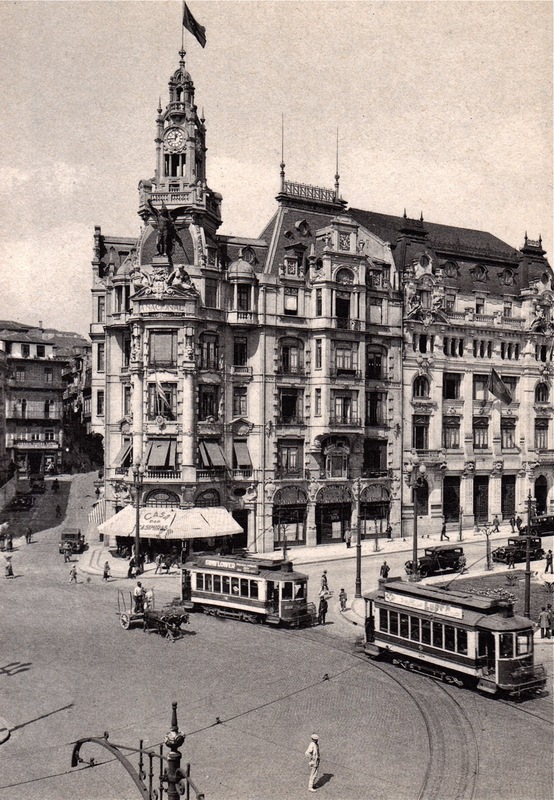 At the bottom-right is tram 108, build during the years 1904-1906 by the local company A Constructora. 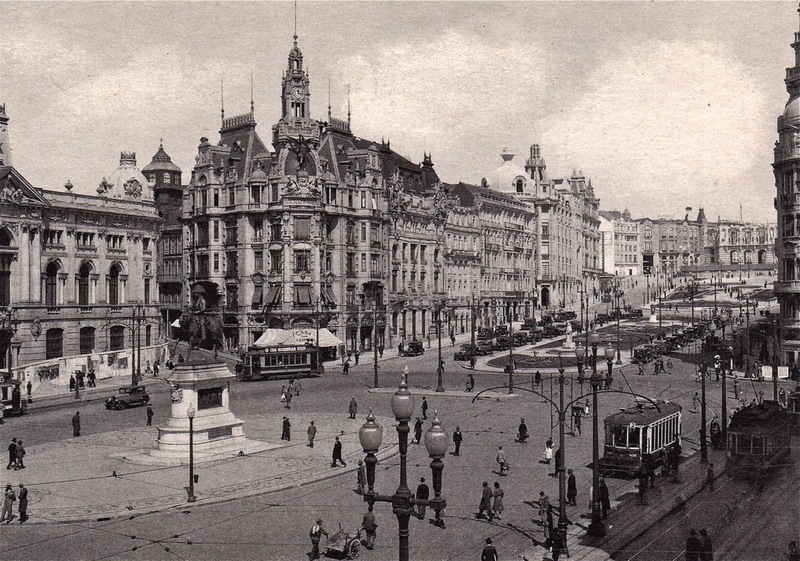 The tram is still green, but the photo is taken after the reconstruction of Praça, which places it in the period 1930-1933. 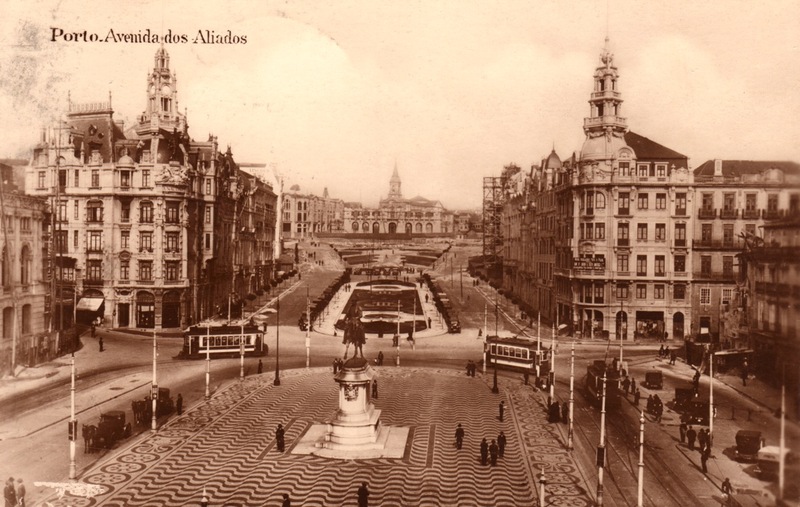 Looking in northern direction we see Praça da Liberdade with the layout of before the 1930 reconstruction and Avenida da Liberdade with the town-hall under construction and the Trindade church behind it. Traffic is right-hand and this places the photo after 1 june 1928. The tram at the left is of the Brill-32 type, constructed by the local workshops during the years 1926-1928. It’s followed by a tram build by the local company A Constructora during the years 1904-1906. The type of the third tram cannot be determined clearly, but it’s likely one of the six trams build by A Constuctora during the years 1901-1903. 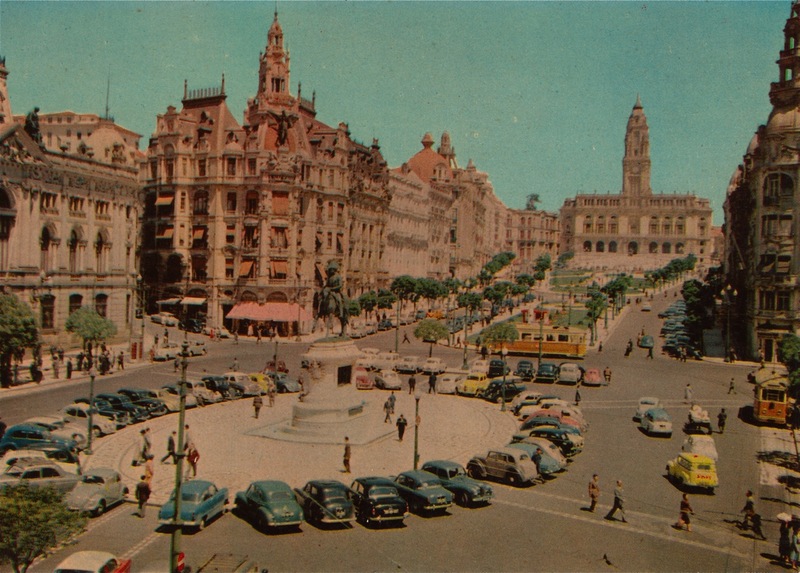 On this postcard we see the south side of Praça da Liberdade with the Palácio das Cardosas. In the background are the Rua, Igreja and Torre dos Clerigos. Traffic is right-hand but the track lay-out is still from before the 1930 reconstruction. This places the photo in the period 1 june 1928 until some time in 1930. 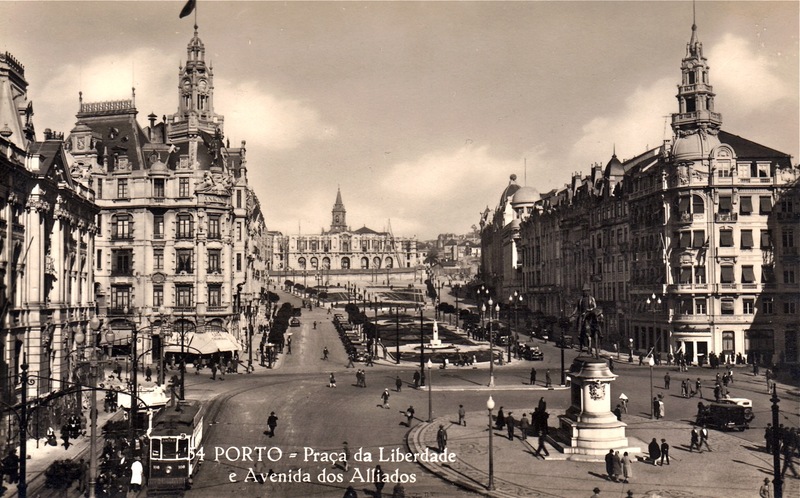 Looking from the south to the north we see on this postcard Praça da Liberdade and the new Avenida dos Aliados. In the background is the new town-hall under construction, something that would last for several decades. One of the trams has fenders, but the other two not, which makes it likely the photo was taken in 1926, the year fenders were installed on the trams. 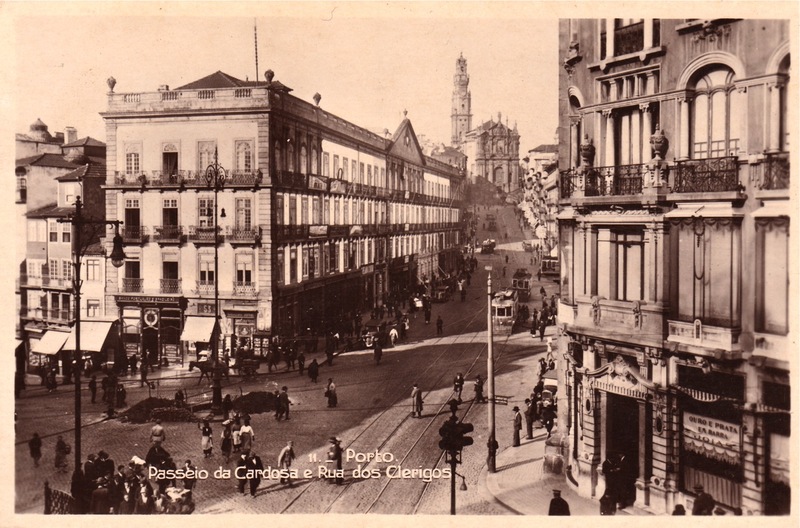 This photo is taken at from the south-east corner of Praça da Liberdade in northern direction. The area at the north side is complete demolished to make the construction of the Avenida dos Aliados and the new town-hall possible. Construction of the first is still in progress. We see two trams ordered from Brill, the one at the right is 288. 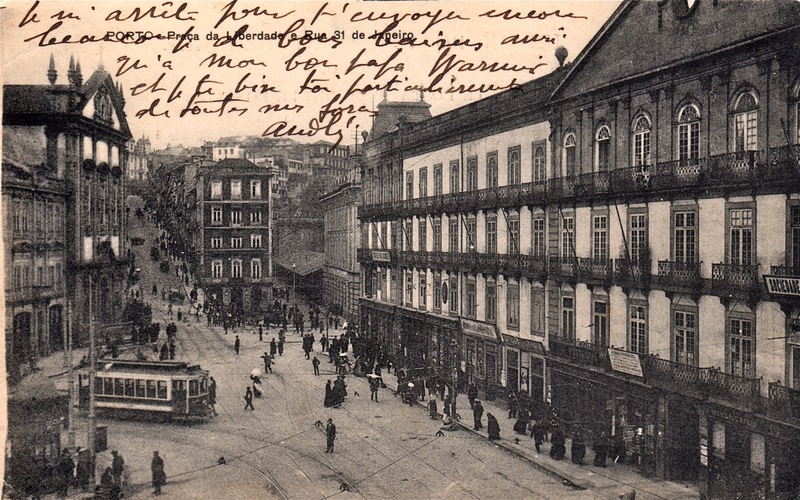 On this postcard we see the east side of Praça da Liberdade. It shows Brill trams ordered in 1909 and 1910. At the right is the Palácio das Cardosas. This postcard show a tram of the series ordered from Brill in 1912. 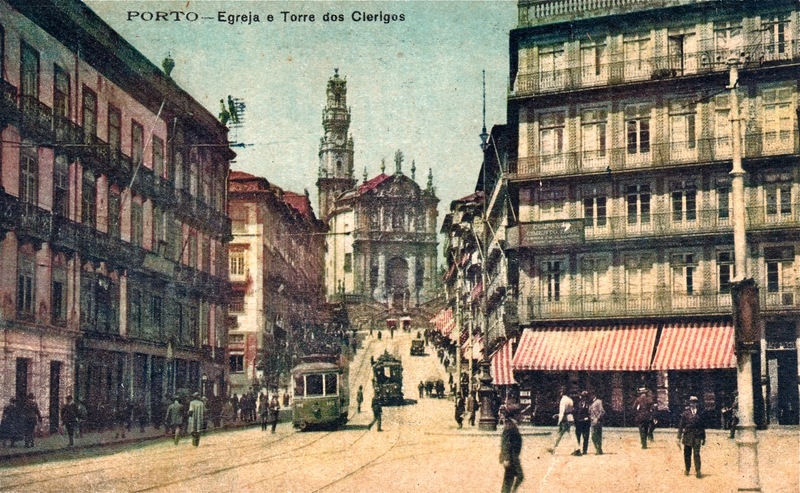 At the left is the Palácio das Cardosas, behind the tram are the Rua, Igreja and Torre dos Clerigos.